Marc talks about what happened today in history, including the day Duke Ellington received the Presidential Medal of Freedom, the 100th anniversary of the Armenian genocide, and the day Augustine John Tolton became ordained as a priest after being born enslaved. This is Marc Steiner, and today is April the 24th. Welcome to This Day In History. ”In the royalty of American music, no man swings more or stands higher than the Duke.” That quote is of course about jazz great Duke Ellington, and we are hearing his song “Take The A Train.” Now you may be surprised to hear that that quote was said by President Richard Nixon. 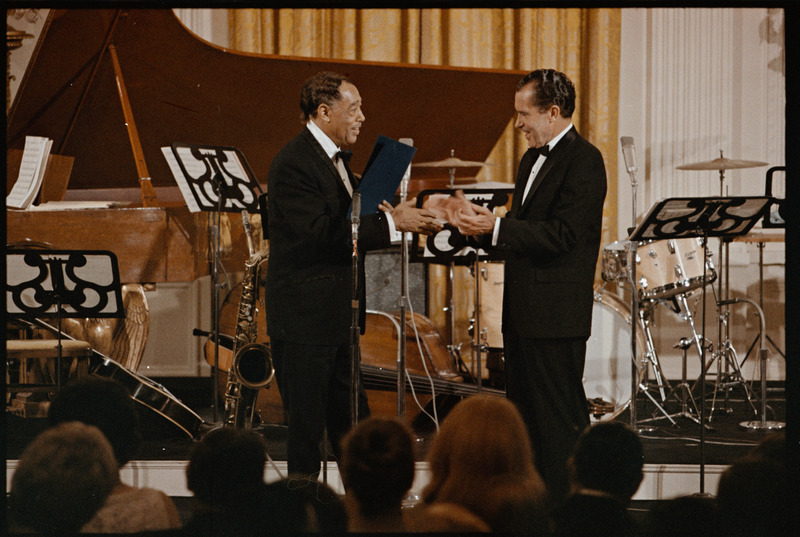 Today in 1969, President Nixon awarded Washington, DC-native Edward Kennedy “Duke” Ellington with the highest civilian honor in the United States, the Presidential Medal of Freedom. We all know about genocide in Cambodia, Rwanda and Nazi Germany, but few know the politicized origins of that word that date back to a 1915 atrocity that began on this day. The word genocide, made up of the Greek roots “genos,” meaning family, and “cide,” meaning to kill, was coined in 1943 by Polish-Jewish lawyer Raphael Lemkin. It was used then to describe the actions of Nazi Germany, but Lemkin came up with that word after coming upon accounts of the slaughter of 1.5 million Armenians by the Ottoman Empire. Today, 250 Armenian intellectuals and community leaders were arrested in Istanbul, which marked the start of that genocide. This is the 100th anniversary of that genocide, but it has taken the world until this century for most governments to recognize the Armenian genocide as a genocide. The reasons why are complicated and political. Turkey to this day admits that massacres took place during war, but they are adamant that no systematic killings of Armenians took place. But, some of the former members of the Ottoman Empire helped found the modern day Turkish state after that empire was defeated, and these were the same men who implemented the policies of that genocide. Turkey became a key ally of the West, further politicizing the history of calling the Armenian genocide a genocide. In fact, it was not until 2004 that the New York Times even printed those words. Just this week, Germany joined a number of other countries who have voted to formally recognize the Armenian genocide as a genocide. Of those countries, the United States is not one. However, 43 states have voted to recognize the genocide. But his family had escaped slavery at the start of the Civil War. His father escaped to join the Union army and his mother fled Missouri for Illinois with her three children.